Choose an optionPetite Magnet - 3.5" X 3"Classic Magnet - 4.88" X 3.38"Grande Magnet - 5.5" X 4.25"
Magnets are printed on extra thick, photo luster paper, which beautifully enhances photos and artwork. (Magnet thickness is 32 points.) You can easily edit colors, fonts, and wording using the online design tool, and it only takes minutes to create a unique design. Start creating your magnet by choosing a size, then click the “Customize Design” button. You may add text, upload photos, and personalize the wording. After finishing your design, simply add it to your cart and choose whether you would like it sent to print immediately or if you prefer an email proof first. You may request a proof if you need help from a designer or have extra time and want to ensure your design is perfect. Proofs are sent via email within 2 business days and your magnets will not go into production until you approve the design. You may request changes and get proof updates for free. Please note, you must finalize your order and submit payment, before you can receive an email proof. An order may be canceled during the proofing process for a full refund, but there are no refunds or exchanges once your magnets have been approved to print. Save the Date Magnets… Get Them Fast! Your magnets will print within 3 business days of your approval and they will ship via the method you choose at checkout. Rush printing options and shipping options are available but delivery dates are not guaranteed. Some items, such as color envelopes, may require additional processing time. We will contact you if the delay will be more than 3 days. Small, petite, and classic size magnets may be mailed with a standard first class stamp in the USA. Larger magnet sizes require extra postage due to thickness and weight. We recommend taking your items to the Post Office to confirm postage rates as rules frequently change. Matte color envelopes are free with your order or you may upgrade to shimmer envelopes for a small fee. Guest addressing and envelope printing services are also included (black ink). Dark envelopes require white ink printing, which is an extra charge. Specific samples can be purchased here. Magnets are printed within 3 business days of design approval. Your order will then be shipped via the method selected during check out. Can I rush my order? Yes, you can rush your order and it will be printed in 1-2 business days. Rush printing costs $25.00 and can be ordered by selecting the “Rush Order” box, located in the additional fees section of the shopping cart. Rush processing does not rush the shipping time. How much postage does it take to mail a magnet? Small, petite, and classic size magnets can be mailed in the USA with a standard, (one-ounce) first class stamp. Grande, mondo, and wood magnets require a two-ounce stamp. Will the magnets get stuck to a mail box? We have not received reports of magnets sticking to mailboxes and causing delivery problems. They are reasonably strong so they’ll last for years on a fridge but not too strong that they’ll get lost. Can I see a proof before you print my magnets? Yes, an email proof can be requested during the order process. Please allow 2 business days for our design team to email the proof. Your magnets won’t be printed until you approve the proof but you can also request changes, if necessary. You’ll find the option to request a proof after you have created your magnet design. Please note, proofs are not emailed unless you have completed your order so you must check out first. Can I get an actual magnet mailed instead of an emailed proof? Yes, you may request a free printed press proof so you can see our exceptional print quality and magnet thickness for yourself. Please note, only one free magnet is allowed per event / household, even if you order using different accounts. If you’d like to receive additional samples, they can be purchased for a small fee by selecting quantity = 1 during checkout. What if I don’t like my proof? Not a problem. We’ll update your proof as many times as necessary for no additional cost. If you still don’t like your proof, you can cancel your order and get a full refund. Yes, click on the tab that says, “Order a Sample” or request a free magnet sampler kit. Of course! View font options here. Can I change the colors? Most design colors and font colors can be changed. View color options. Can I upload my own design? Yes! You can upload your own custom artwork or design file for printing. If you have any questions about what size your file needs to be, please take a look at our guidelines. What size should my photo / artwork be? We recommend using high quality photos that are 300 dpi and we’ve listed some size guidelines below. However, if your photo doesn’t meet these guidelines, chances are good that it will still print nicely. Our design team will review your photo and contact you if they feel that the quality is too poor. We recommend enlarging your photo to 300% on your monitor before you submit the file. If it looks good when enlarged, it should print well. Size suggestions, listed in pixels, for magnets with a photo that goes edge-to-edge. Size listed below includes a 1/8″ bleed. Do I need to have my guest addresses ready when I place my order? If your spreadsheet isn’t ready, don’t worry, you can e-mail it to us later. Click here to download the guest address spreadsheet template. Can I make changes after my order is placed? Yes, you can make changes to your order as long as you you haven’t approved your proof. Once your order has been approved we aren’t able to make further changes. Personalized and printed items are not eligible for return or refund. Non-personalized items are returnable, but you must pay the shipping cost to mail it back. We strongly encourage you to order a free printed press proof before placing a larger order so you can inspect our product quality and make sure you’re happy with the design. Speed estimate does not include processing time. Estimated delivery time is shown in business days (Monday – Friday). Orders shipped outside the USA may be subject to duties, taxes, or fees. These fees are imposed by the destination city, province, or country. New and Blue does not have control over these charges nor are we able to provide fee estimates. The recipient is responsible for paying additional duties and fees at time of delivery. Limited tracking information is available on international shipments and delays due to customs inspections are possible. Please allow extra time when ordering outside the USA. Actual delivery time is not guaranteed. Design a magnet, add qty “1” to cart. One magnet sample allowed per event. AMAZING! !I ordered this style for my save the dates and they looked amazing! We had some trouble with wording not showing up on the magnet and they called immediately to help us find a solution. I ordered rush shipping and even with our little mishap they were still printed and shipped within the timeframe. Amazing company, amazing quality and the price is fantastic! If you’re on the fence, I’d sefimitely recommend using them! Liners are installed in the envelope color you have chosen. Matte liners, $.75 each. Shimmer liners, $.90 each. Glitter liners, $1.25 each. Envelope liners may require additional processing time. You will be notified if your expected delay exceeds 5 business days. Purchase a single magnet (quantity of 1), on our website, https://www.newandblue.com. Your magnet will be printed within 3 business days of your design approval and will come with a promotional code for use on your next order. If you don’t LOVE your magnet, simply mail it back and we’ll refund your money. I want to mail back my sample magnet, where do I ship it? Your magnet should be returned to the address below, along with your order number. Return shipping is at the customer’s expense. How many magnets can I order with the guarantee? The magnet guarantee is valid on a single magnet order, quantity of 1, per household. I ordered 100 magnets but made a mistake on my design. Can I get a refund? No, sorry. Printed items are not eligible for refunds or re-prints. 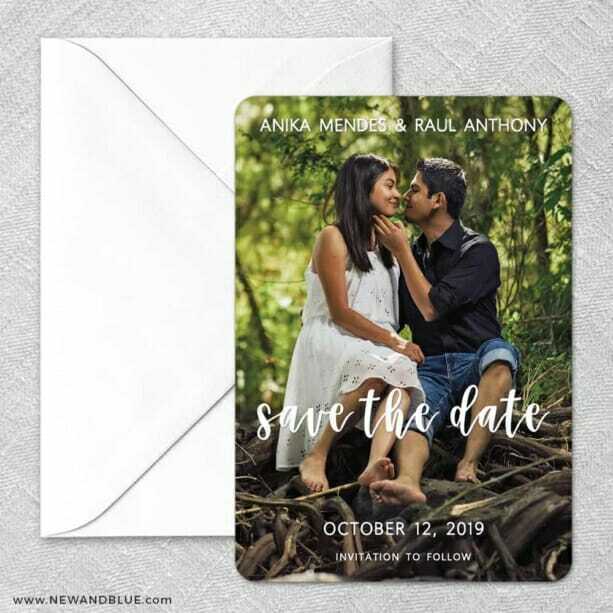 Our guarantee only applies to a single, customized save the date magnet sample. I don’t have time to wait for the sample, is my order still guaranteed? We strongly advise you to order a single magnet first, so you can ensure you approve of the design and quality. If you place an order for a quantity larger than 1, it is not guaranteed and there are no reprints or refunds.